Are you ready? Year-end is upon us. As part of a yearly tradition, we are providing you with resources and reminders to assist your firm with year-end processing. Check out the information below, and let us know if you have any questions. As we come into the holiday season many of us in accounting face the coming season, not only with the joy of family and friends coming together, but with a sense of impending dread – YEAR-END and TAX SEASON are looming – ugh - have another drink. W-2s - 1099s - journal entries - checking and double checking each number! Auditors - shareholder meetings - endless explanations’ of what the results mean (even though you have been saying for the past 6 months) - Oh the joy of the season! As we go through the year-end process there are mistakes we (and others) make that are easy to recover from like entering the 15 page depreciation journal entry “backwards” at midnight sitting in your semi dark office chugging your 15th pot of coffee. Some are more difficult – like removing all the lower levels of your work break-down structure (did that once – glad our backups worked). So outside of deleting the database, what are some of the items in Vision year end processing that are hard to recover from? Is Your Deltek Vision System Year-End Process Stress Free? Year-end is always a stressful time of year, but it doesn’t have to be. As with everything else in the world of Accounting, planning and preparation is the key to a successful and stress-free year end. Check out this article talk provides a few tips to make your year-end close just a little easier. Webinar: Stress Free Year-End Process - Yes You Can! We hope these resources serve as good reminder. Best wishes from the Full Sail Partners' staff! Wishing you a prosperous 2014. Working in the most recent release of your Deltek solution ensures your firm is benefiting from all the features and enhancements engineered into the latest versions of Vision. Your support and maintenance plan entitles your firm to download the latest version of your product here if you're not up-to-date! Year-end updates in 2014 will be supported only on Vision 7.2 and Vision 7.3. Regulatory updates for releases prior to Vision 7.2 will not be delivered. Check out the Deltek Support Assurance Product Lifecycle on the Deltek Customer Care Connect website for the latest information on your product's status and definitions of the support delivered in the Active, Maintenance, and Sustaining phases. Is Your Firm Prepared for Deltek Vision 7.3? Because of Microsoft’s de-support of Windows XP in April 2014, Deltek can no longer support the Windows XP client operating system beginning with Vision 7.3 and extending to future releases. Additionally, to use this new version you must ensure that .NET Framework 4.5 or 4.5.1 is installed. For more information on the .NET Framework and to determine how best to deploy the 4.5 or 4.5.1 release within your organization, please refer to the Microsoft web site at http://www.microsoft.com/net. Are you ready? Year-end is upon us. 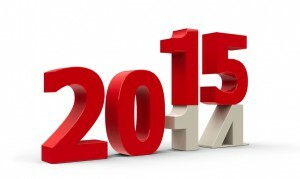 We thought we would highlight some resources to assist firms with year-end processing. One of the most important tasks within any organization is lead management. It is vital for the sales staff to have the most comprehensive and up to date information available on a new lead. With this information the sales or marketing team can seamlessly follow the Lead qualification processes established by your firm. Once it has been established that a Lead is a qualified prospect, it is time to convert the lead into a company, opportunity and/or contact. Did you know that you don’t have to create each record in the respective info centers and enter the same information over and over? Vision can use the information from the Leads Info Center to create the Company, Opportunity and Contacts records in a few easy steps. Here is how it works… In the lead info center menu, there is a “Convert” option. By choosing this option, you will receive a dialogue box that is defaulted to qualify the lead. There is also the option to disqualify a lead if need be, but we will focus on lead qualification. 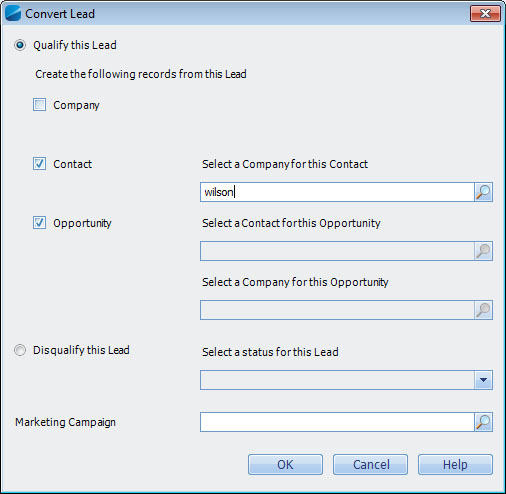 Within the dialogue box you will have the option to convert the information entered into the Leads info center over to a company, contact or opportunity. You may only want to convert this lead to a contact or maybe you only want to have them set up in the company and contact info centers, you can do so by checking only the radial button next to those options. You may also want to associate this lead with the corresponding Marketing Campaign that brought you the Lead. The appropriate campaign may be selected from the drop down box at the bottom of the dialogue box. Once you have checked the appropriate options and associated the Lead with a marketing campaign (if appropriate), you will select the ok button. Vision will create a new Company, Contact and Opportunity for this Lead. All the corresponding information such as Company name, address, phone number, e-mail address, company type, etc for this Lead will be copied into the fields in the new records created in the Company, Contacts and/or Opportunity info centers you have selected. Your company now has all of the lead management information necessary to track this client in the Client Info Center, including associating the new contact record with the company. Within the newly created opportunity is all the vital data your sales team will need to engage and move forward with the sales process. The transfer of this information has been done without the need to manually copy and paste between the info centers. Vision has copied the information for you within seconds and the focus can now turn from qualifying the Lead to managing the sales process and closing the deal. Learn more about Deltek Vision CRM. So, you are in the Cloud! Your company has purchased Deltek Vision Essentials ERP software and you have been assigned as the SaaS Administrator. You may find yourself wondering, “What does this mean for me? What do I need to do first? Where do I start?” At first the task may seem overwhelming as you receive letters, guides and instructions on “How to get started.” We at Full Sail Partners want you to know that you are not alone, and that we have put together answers to some of the questions asked most often when a client purchases their new Cloud solution. As the assigned SaaS Administrator, you will receive a welcome letter. The most important task to perform at this time is to print out and read the SaaS Administrator Guide. It will be a valuable resource for you during the initial set up. What is the next step after I read the guide? The second most important task as the SaaS Administrator is to set up your Deltek Customer Care Account. This account will be where most communication takes place between you and Deltek. If you are not a new client and will be migrating data from an existing Vision database or a prior Deltek product, this portal will be the first stop to transfer your files. Can’t I just have Full Sail Partners set up my account? Because of the importance placed on security, only the Saas Administrator may submit service requests on behalf of their firm. These requests are submitted solely through your account access on the Deltek Customer Care portal. The SaaS administrator will work closely with Full Sail Partners on the implementation process. However, only the SaaS Administrator can request things like data uploads, receive system maintenance communications, request backup restores, submit invoice graphics or request a sandbox. How do I keep up with announcements regarding scheduled maintenance or issues with my service? The SaaS Administrator must also subscribe to the Deltek Vision knowledge based article 67385. The article can be accessed at: http://bit.ly/143PgnX. This page is used by Deltek specifically for Vision Essentials related communications—including announcements regarding planned and unplanned maintenance. In order to stay abreast of the most recent announcements, it is important the SaaS Administrator signs up for notification alerts from this article. You may do so by choosing the “notify me” selection at the bottom of the screen on the Deltek Vision knowledge based article page. A dialogue box will then appear stating your request has been successfully submitted. 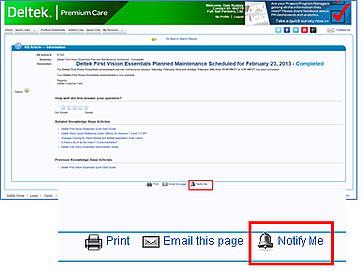 Click OK. You are now set up to receive any notifications about maintenance or access issues with your Vision Essentials software. As the primary person responsible, what if I am not available? Can a second Administrator be added? Absolutely! Deltek encourages all clients in the Cloud to have a second administrator assigned to their account. 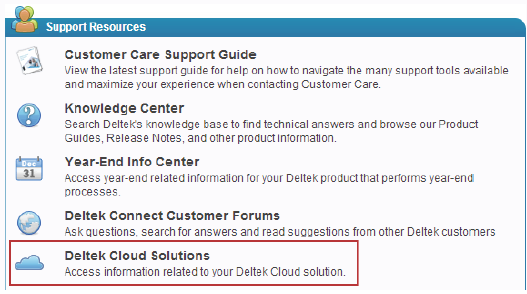 You, as the SaaS administrator, may request a second administrator be named through the Deltek Customer Care Portal. The request should include the full name and email address of the administrator that is being added or changed. You may even assign Full Sail Partners as your second Administrator. This will give us the ability to upload databases and custom files directly for you. Your account manager with Full Sail Partners can provide you with the appropriate name and e-mail information if you decide to assign our firm as your second SaaS administrator. How do I add graphics to my firms invoices? 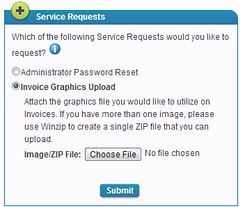 Graphics can be added by sending a request through the Deltek Customer Care Support Site. You will be asked to submit the graphics image file you want to use, so please make sure to have it on hand before starting the request. My firm has experienced a serious event that has created the need for a backup and restore of our data. May I request the data from a specific point in time? Yes. Deltek back-ups client data no less than once every 24 hours. There is also a backup performed once every 7 days. The daily backups are kept for 1 week and the weekly backups are kept for 4 weeks. If you require a restore from a specific point in time, you may send the request through Deltek Customer Care indicating the past time frame you need for the restore. You must also include the time that you would like for the restore to take place as your system will be unavailable while the restore is performed. Vision Essentials clients are allowed 4 Backup and restores per year. Is there other information I should review? Being the SaaS Administrator is a very important assignment. Keep in mind, you are the keystone for communication between your firm and Deltek. Being informed by familiarizing yourself with the SaaS Administrator Guide and subscribing to the Deltek Knowledge Based Article 67385 which will notify you of the availability and functionality of your Vision system is essential to your success as the SaaS Administrator for your firm. Ready to take the next step? Empower your employees through training! According to a study by the American Society for Training and Development, companies that invested the most in training had a shareholder return that was 46% percent higher than the market average. In a recent survey conducted by Full Sail Partners, 33% of clients did not understand the services provided by Deltek support vs. Full Sail Partners. Additionally, some clients don't understand what a Deltek Partner is and the value a partner can provide. So let's address these questions. What is a Deltek Partner? Deltek partners with a wide range of companies that act as an extension of their business. These partners include Infrastructure Technology Companies, Independent Software Vendors, Resellers, Consulting Partners, CPA Accountant Networks, and Hosting Companies. Full Sail Partners is an authorized software reseller, consulting partner, and application hosting partner. As a Deltek Partner, what is your relationship to our firm? Clients might be assigned to a Deltek Partner to help manage the relationship. The management of that relationship includes administering your annual maintenance contract, providing you consulting services, and serving as your Deltek liaison regarding upgrades, expansions, maintenance questions, or Deltek announcements. As a Deltek Partner, we also believe it is important to educate our clients through local user groups and our free webinars. When would I call Deltek Support vs. calling Full Sail Partners, my Deltek Partner? Deltek Customer Care Support is included as a part of your annual maintenance contract or your subscription. 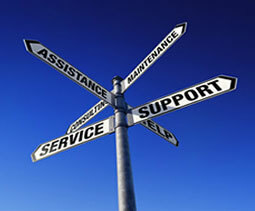 As a part of your maintenance, Deltek Customer Care provides a forum and a knowledge base to answer technical questions. When answers can’t be found through those avenues, support can be contacted via phone at 877.457.77565 or through the web at http://support.deltek.com. For example, if you receive an error message while using the software, experience a software defect or need troubleshooting, or have a technical software questions, support can provide you answers. If your question is related to how to use the software, best practices, training, implementation, customization, or hosting services then Full Sail Partners can assist. When in doubt we encourage you to reach out to your consultant or your Account Manager at Full Sail, we can help direct you to the right resource. Who is our Account Manager at Full Sail Partners? As an Account Manager at Full Sail Partners, my role is responsible for directing your firm to the proper channel and identify the most skilled resources to address your question or concern. My contact information: Dale Busbey | 888.552.5535 x107 | dbusbey@fullsailpartners.com. Still need further clarification? Add a comment to start the dialogue regarding your Deltek Vision Support needs.